Thanksgiving is a joyous time of year when we express our appreciation and love by sharing a memorable meal with family and friends. 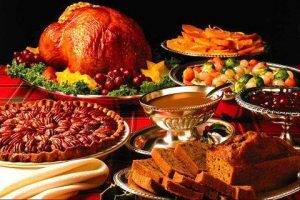 In fact, food takes center stage not only on Thanksgiving Day, but during the other winter holidays as well. It’s during this celebratory time of year however, that there is a considerable amount of food waste. Considering the fact that according to the USDA, Americans waste 96 billion pounds of food each year (translating to a loss of $100 billion annually), and that food loss at holiday time is a big culprit of such waste, what can you do to green the waste? Always plan your weekly menu before you shop. Calculate what you’ll need to purchase by making a shopping list. If you have leftovers, make sure to store the food in recyclable containers. If you’re able to freeze the food for later use, great! Leftovers can sometimes taste better the next day vs. the main event. If you’re at a loss of how to repurpose your food, Google how you can creatively create recipes from Thanksgiving Day leftovers. Invite friends and family over to “share the wealth” – perhaps enjoying a “pot luck” dinner where everyone can bring their favorite leftover dish. Food banks and shelters welcome canned and dried food donations. Check with your local area what organizations take donations.